Microsoft's Windows Phone store has hit a new milestone for apps, but still faces some of the same old challenges. According to Microsoft's "By the Numbers" website, the Windows Phone Store now has 300,000 apps, compared to 200,000 apps last December. WPCentral first spotted the updated figures on Microsoft's site. Of course, most people don't need nearly that many apps—the average user relies on about two dozen per month, according to Nielsen—but a big app count increases the odds that you'll find exactly what you're looking for. On that front, Microsoft still has a long way to go compared to the more than 1 million apps available in iOS and Android's respective app stores. 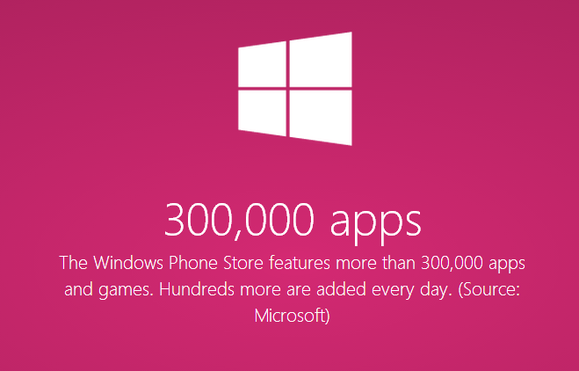 Microsoft heralded the 300,000 app achievement on its 'By the numbers' website. Microsoft also has some bigger problems that aren't reflected in the numbers at all. The company has occasionally encouraged shovelware with cash incentives for app development and cookie-cutter app creation tools for non-developers. It has also angered some larger companies by repackaging their websites as native apps without permission (though Microsoft seems to have abandoned that practice). And among bigger-name apps, the Windows Store sometimes struggles with quality, as developers treat the platform like an afterthought. New features that arrive on iOS or Android take much longer to show up on Windows Phone if they arrive at all, which means Windows Phone users can't snap videos in Yelp, listen to full songs in Shazam or use the free version of Spotify. Still, Microsoft isn't throwing in the towel. Windows Phone recently added apps for Uber and Fitbit (though it's unclear what happened to Flipboard after it was announced last year). And with a renewed focus on low-end handsets, Microsoft is hoping a higher volume of new users will finally get developers interested in the platform.